I felt a lot better after Brendon calmed me down. "(Y-Y/N), are you ok?" Josh asks as him and Tyler walk out from the other room. "Yeah, what happened?" Tyler asked. "I-I don&apos;t k-know. I was having this terrible nightmare then all of a sudden you guys all rush in to me and im crying like crazy." I respond. Brendon pulls me in for another tight hug as my eyes start watering just thinking about the situation. "What was your nightmare about?" Brendon asks. I think for a minute trying to remember every detail but when I do I start crying. "It w-was ab-about you b-Brendon!" I say in between sobs. "Shhh, Shhh, its ok. its ok. Im right here!" Brendon says trying to calm me down. "It was Sarah...S-she...we were...a-at d-dinner and in-instead of h-er punching me in the face" I say trying to hold it together but I suddenly pause. "What is it? What did she do?" Josh asks. "She killed Brendon!" I answer crying hysterically now. Brendon pulls me close to his chest as I cry holding him tight and I don&apos;t let go. "Its fine, im here right? She cant hurt me. Im in completely perfect shape. Im not wounded." He says trying his best to calm me down. 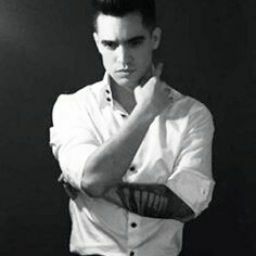 "I Know Brendon. But I saw everything, how she killed you, your facial expressions. Everything. It was terrible, it was like a dream I couldn&apos;t wake up from. It felt like reality." I told them. 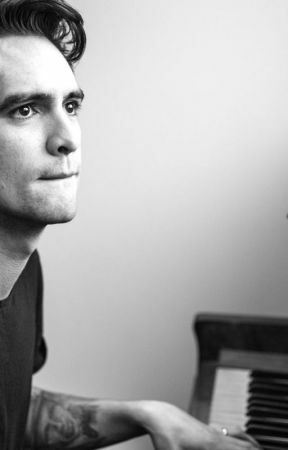 Brendon gives me a small kiss to my stitched cheek. "That&apos;s why she screamed your name Brendon. It all makes more sense." Tyler said. "Wait, I woke up screaming Brendon?" I ask confused. "Yeah, but its ok. Ill sleep on the couch with you so maybe I can help." Brendon says. I agree as me and Brendon get settled on the couch and Tyler and Josh go back to bed. About an hour later I woke up and (Y/N) was gone. I just sat there thinking that she could have gone to the bathroom but then all of a sudden I hear a girls voice, singing, my song! It was coming from outside. Josh slowly and quietly walks out to me and holds his finger to his lips mouthing &apos;shhh&apos;. He walked over and sat down next to me. "That&apos;s (Y/N) singing" he whispered to me. "Wait? How do you know?" I whisper back. "Ok, number 1, she&apos;s not in the tour bus, and number two, I looked out the window and saw her." He mumbles being all smart about it. I slowly walk over to the window and peeked my head through the curtain. It was most defiantly her. I look at Josh as if sending him telepathic thoughts and he gives me an encouraging nod. I slowly open the door and close it trying to make the least sound possible. I didn&apos;t know what to do. She was just singing my songs. Without music too. She knew my songs by heart! She was singing &apos;This Is Gospel&apos;. "This is gospel, for the fallen ones locked away in permanent slumber" she began. I was so impressed I had to let her keep going. "Assembling their philosophies from pieces of broken memories"
Her voice sounded so much better without music to be perfectly honest. I was trying so hard to be quiet. I looked behind me to see Josh and Tyler looking through the window. Tyler jives me a short thumbs up and Josh gives me a long shhh sign. I turn my gaze back to (Y/N) as she kept singing. "Oh-----------oh, oh------------oh. Their gnashing teeth and criminal tongues conspire against the odds, but they haven&apos;t seen the best of us yet "
But when that chorus hit I sang along with her. So at the same time we both sang "If you Love Me let me Go------" But once she heard me she stopped and screamed a bit placing her hand on her heart. I just kept singing however. "If you love me let me go-----, cuz these words are knifes and often leave scars, the fear of falling apart. Truth be told  I never was yours, the fear, the fear of falling apart"
She just stood there blushing her hand to her heart and breathing fast. Still singing I walked up to her and placed her hand in mine. As I was singing she slowly started to sing to. She was singing with me! I could tell Tyler and Josh were in the bus Going crazy but I was too happy to notice. After we finished the song I pulled her close to my warm chest. "I-im so so-sorry. I didn&apos;t mean t-to wake you." She said. "No no no, you didn&apos;t wake me. I woke up on my own. And Josh told me you were out here." I said quickly realizing it was a mistake to tell her Josh knew. "Wait! Josh heard me SING?!!!" She asked. "Uh...yeah, he was the one that told me you had left." I said trying not to sound like an idiot. She was a blushing mess! "W-well, ok, a drummer and a singer heard me sing. At least the other singer didn&apos;t hear me." she says and I look back at the window which had now been opened and Tyler give me this &apos;oops&apos; look. I look back at (Y/N) and give her the same look. She starts blushing more and more by the second. I feel as im making things worse. "Ugh! Great! Now the two best singers in the world heard me, the most terrible singer ever, blow their ear drums out!" She said. "Wait what!? You think your the worst singer out there!? Omg, your amazing! I&apos;ve never heard anyone better than you." I say and she gives me a small smile. "Except you" She jokes. I play along. "Except me, that&apos;s right." We both chuckle and talk a little before we decide since were up and not so tired anymore to play a guessing game. "Ok, So ill sing a verse to one of my songs and you have to try and guess that song. Lets see how many of my songs you know." I say and she giggles and accepts the challenge. Back to the street where we began, feeling as good as lovers can you know. Yeah, were feeling so good. I sing and she immediately answers. "NINE IN THE AFTERNOON!" She shouts which was correct but then Tyler and Josh end up coming out and they decide to play against (Y/N). "Ok, ok. How about this one." I say clearing my throat. I feel the salty waves come in, I feel them crash against my skin and I smile as I respire because I know they&apos;ll never win. I song and again (Y/N) answers right away before anyone else does. We keep playing for about 30 minutes and (Y/N) wins every round. We decide to go back inside and try to sleep. (Y/N) and I cuddle back up on the couch and we fall fast asleep in each others arms.